Our community is a tight knit group. So when something in one of our conferences needs to change, we listen to what presenters and attendees have to say. This year, the location for the EFA Expo & Conference was not the right fit for the conference and the attendees let us know, providing great feedback onsite and through a post-event survey. We heard you loud and clear and are excited to announce that the 2018 EFA Expo & Conference will be held at the Savannah International Trade & Convention Center in Savannah, Georgia. Savannah will be a great city to visit and the location is the perfect size for the EFA program and for attendees to have those chance encounters and conversations they have come to enjoy. In addition, we've extended the deadline for the call for presentations to June 28, 2017, by 5 P.M. PDT. A Tool - "Emergency Department Throughput Strategies Considerations Checklist"
You can get excerpts from this toolbox and read more about it here. The Center also provides a variety of events - sometimes in-person offerings or through the convenience of our online learning opportunities that include live and on demand webinars and EBD Journal Clubs. Upcoming events include the Boston Health Design Insights Networking Event, our seventh annual Emergency Department Workshop and the first-ever Content Collaborative on ambulatory care design. You can view all of our upcoming events on our website calendar. Member Project: "East Morgan County Hospital Kitchen and Dining, Brush, CO"
Case Study: "Integrated Team Care in a Clinic Designed to Promote Collaboration and Communication"
Webinar: "Innovative Hospitals Creatd by Architecture's Most Renowned Designers"
Blog: "The Importance of Team in the ED"
As always, let me know what tools and resources have been helpful to you in the past, and we'll feature them in our future newsletters. Secure facilities are essential to patient care. “At its highest level, one of the missions of a health care organization is to make sure that we are doing no harm to our patients and to our staff. Part of that is the assumption that we create environments that promote safety and security,” says Manuel Hernandez, M.D., FACEP, CPE, emergency department physician and health practice leader for architecture firm CannonDesign. “Unfortunately, we have too many lessons from the past of what has happened when that [security] has failed,” Hernandez adds. Incidents of violent behavior and pharmaceutical theft demonstrate the need for health care organizations to think about security in facility design and planning, he says. The way medical facilities operate must change exponentially as new technologies develop and new legislation is introduced. Effective space programming is key for optimal decision making while continually navigating growth and change. Patients often view the waiting room as an unproductive space where they sit for a delayed appointment, while project teams and facility owners see a space that represents both construction and ongoing maintenance costs. This leads to the idea that it’s in everyone’s best interest to reduce time spent waiting as well as the amount of space programmed for waiting. Not all waiting can be eradicated, however. There are times in an ambulatory environment when there should be people in a waiting room, rather than in a clinical space. For example, some patients are driven to appointments by a neighbor or friend who they don’t want accompanying them into the exam room. Sometimes, it’s the clinician who requires time alone with a patient. Healthcare Design, more . . . The internationally acclaimed CODAawards celebrate the design projects that most successfully integrate commissioned art into interior, architectural, or public spaces. The awards honor the individuals and the teams whose collective imaginations create the public and private spaces that inspire us every day. Submit projects for consideration by May 31, 2017. codaworx, more . . . Final Days to Register for the 7th Annual Emergency Department Workshop! An ED Design Case Study & Simulation - Considered a workshop highlight by past attendees. Presented with a challenge-filled ED design case study – including competing financial, operational, throughput and staff inputs – teams will strategize and program an approach to inform a design in “response” to a Board request for an ER space needs plan. Then they will design an emergency department layout and test against actual patient flow data to evaluate effectiveness and identify lessons learned. The presenting faculty's work puts them on the forefront of today’s most promising design innovations and facility based solutions, making their insights invaluable to anyone designing, building or renovating an emergency department. – you’ll engage, discuss and interact with leaders from the design industry, healthcare, academia and other members of our expert presenting faculty. Together you’ll learn to evaluate competing priorities and challenges, and solve them using design innovations and facility based solutions. Insights gained from an expert faculty, plus the latest case studies and benchmark data, are invaluable to anyone designing, building or renovating an emergency department. 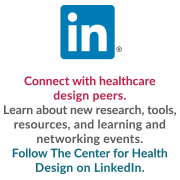 Come meet and connect with CHD Affiliate members and the regional healthcare design community for "Innovations in Healthcare Design" - an informal, creative presentation, (worth one EDAC/AIA credit) at 5:00 p.m., followed by wine and hors d’oeuvres. These events are FREE to CHD Affiliate Members and Partners. Non-members can attend for a $40 donation. Inaugural forum for advancement in healthcare facilities: collaboration to create a healthy indoor environment that supports patient healing. Evidence-Based Design (EBD) Journal Clubs are free, open to all and provide one EDAC/AIA CEU. These sessions provide opportunities to interact with authors who have recently published EBD papers and articles in peer-reviewed journals such as HERD and learn as they share ways to put their research into practice. Come see the projects The Center's Affiliate members are working on, including the project's mission, vision and lessons learned.